Understand the different types of tea events. All of them may be casual or more formal, but it is rarely acceptable to host or attend wearing sweatpants or jeans and sneakers. Afternoon tea—Also known as “low tea,” the afternoon tea is enjoyed at a low table, such as a coffee or tea table in the living room. It is a more relaxed setting than the high tea, but it isn’t necessarily more casual. High tea—This is served at a dining table or higher table than the low tea. You may have a high tea with small snacks or offer something more substantial. Cream tea—The occasion that involves tea being enjoyed in the afternoon, with clotted cream or scones is often referred to as the cream tea. Royale tea—Add champagne or sherry to the tea for a Royale tea. Use clotted cream. This spread for your scones is something that takes very little effort yet makes the tea so much more elegant. It can be purchased or homemade. Use loose tea. Although tea bags are acceptable, loose tea is the preferred type of tea. The flavors are more pronounced, and the experience of using loose tea is more elegant and adds to the experience. Steep the tea for an appropriate length of time. Let the tea settle long enough for the flavors and antioxidants to flow into the water, but don’t leave it so long it gets bitter and harsh tasting. The ideal length of time is approximately five or six minutes. Feel free to request specific milk. Some of the options, in addition to cow’s milk, include almond, coconut, and soy. If you are enjoying tea in a private home, rather than demand a specific type of milk, ask what is available. Replenish the tea. It’s bad form to let the teapot go empty. It’s always important to start with a clean pot, so it’s not a bad idea to have more than one. Eat the food properly. The finger sandwiches should be eaten with your hands, and the cakes should be consumed with a fork. Don’t take huge bites. It’s better to nibble or take small bites to keep from looking like you haven’t eaten in days. Take your time. When enjoying an English tea, you should enjoy it in a leisurely manner and not gorge like it’s your last meal. 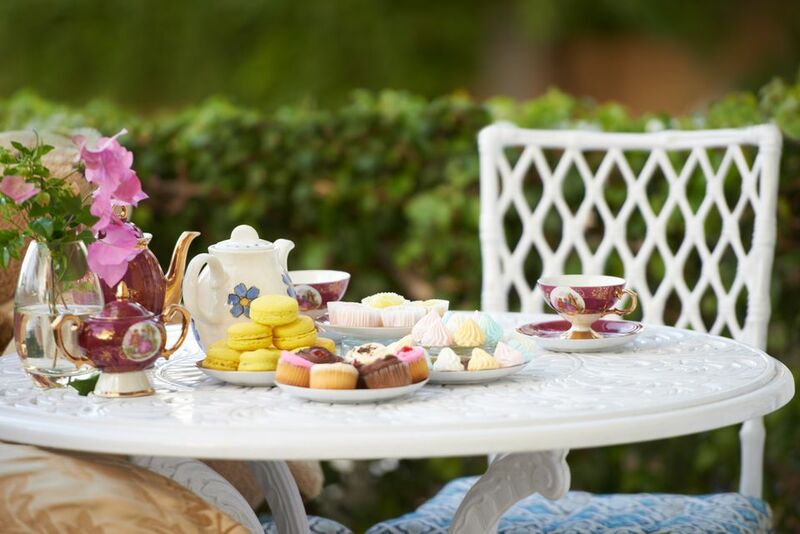 An afternoon tea gives you a chance to relax in the middle of the day, so take advantage of it. Use a napkin properly. It doesn’t matter whether it’s paper or linen; instead of vigorously wiping your mouth (or anything else, for that matter), gently blot your lips. If you're a guest, don't forget to send a thank you note to the host. Don’t lift your pinky. Someone somewhere started the myth that raising the pinky finger helps balance the teacup. This is not true, so there is no point in raising it. Don’t add the milk first. This is especially the case if the host pours the first cup of tea for the guests. Add the milk to the teacup after the tea has been poured. However, it is perfectly acceptable to put the sugar or lemon in the cup before you pour the tea. Don’t add milk to white or green tea. Save the milk and cream for black tea. Don’t forget to use the strainer. When steeping loose tea, some of the tealeaves get loose in the water. You don’t want to have to pick the leaves out of your teeth when you finish. Don’t stir your tea like you’re beating cake mix. Use a gentle motion and take care not to make a noise by clinking the spoon against the inside of the cup. Don’t leave your spoon in the cup after you stir it. Place it on the saucer behind the cup. Don’t dunk your biscuits or scones. This is rude. It’s better to break off small pieces and spread a little bit of clotted cream to each bite. Don’t show up in sportswear, sweats, or sneakers. Even a casual tea commands more respect than that. A skirt and blows, knit dress, or nice pair of trousers will be more appropriate. Men should wear clean trousers and collared shirts. While there is nothing wrong with bringing up controversial topics during your tea party, don’t let the conversation escalate to the point of becoming a brawl. The instant you feel your blood pressure go up, change the subject to something completely different. If the other people don’t take the hint, simply state that you would like to discuss something that isn’t so bothersome. If you’re the host of a tea party, it’s always a good idea to have some discussion topics planned to make sure there are no lulls in conversation. Some fun things to discuss include the history of tea, the varieties of tea, British royalty, and of course, there’s that old standby—the weather. If you’re a guest, follow the lead of the host. If she changes the subject, accept it and go with the flow. Be gracious and friendly throughout the party. If you enjoy the tea that’s being served, go ahead and pour some more. If you don’t care for it, take small sips—or at least pretend to—and keep your opinions to yourself. The English tea is such an enjoyable occasion it’s hard to imagine why everyone doesn’t embrace the practice. Take some time out of the afternoon and have some tea as you chat with friends or reflect on life.